"I wanna go back, go back, go back to dear old Syracuse!" 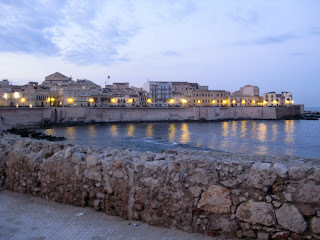 Or as i Siciliani spell it, Siracusa. What a place! Mi piace! Of course all trips have ups and downs and of this trip it could be said that "it was the best of times, it was the worst of times..." Well, hardly the "worst" but largely due to less than perfect planning, while for the most part I had a grand time I also missed out on some sites and sights that I should have got to. So while the quote just above is not entirely accurate (and is very likely the product of my having taught my French Revolution seminar once too often), I can say that it was definitely a tale of two cities, and in more ways than one. 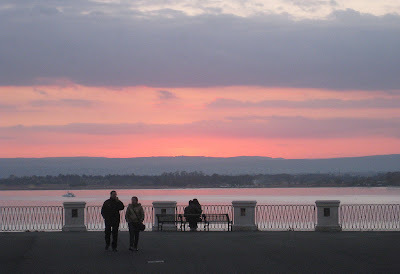 There are great differences between Siracusa and Catania, but so are there marked differences between what I think of as the two cities OF Siracusa: the island of Ortigia and the mainland portion of Siracusa. 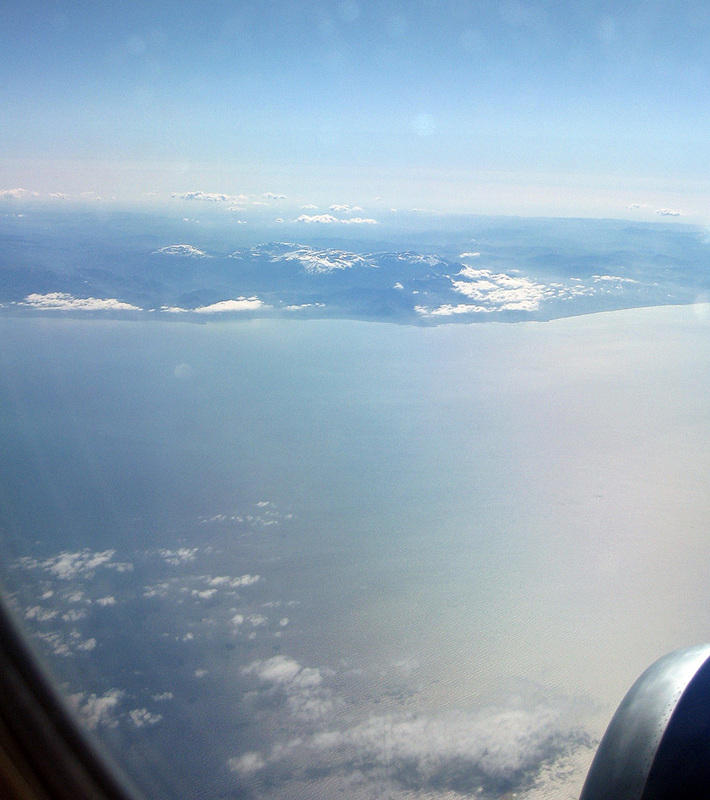 an island that I'm nearly certain was Corsica, and finally the coast of Sicily (below)from my window. 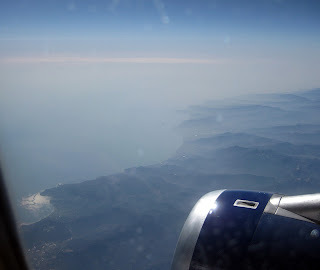 I was on the wrong side of the plane to see Mt Etna, but one can't have everything, can one? Once on land passport control took no time at all, but there was quite a wait for the bus from Catania Fontanarossa Airport to Siracusa. 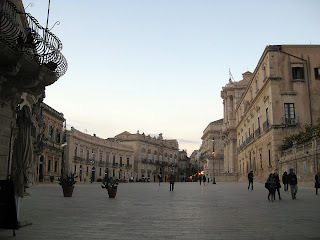 And once on the bus, what first-timers in Sicily thought was a shuttle bus, direct to the Siracusa bus station, was in fact a regional bus with several stops in Siracusa before the station, making for much confusion on the part of me and about ten others who were wondering which stop was ours! 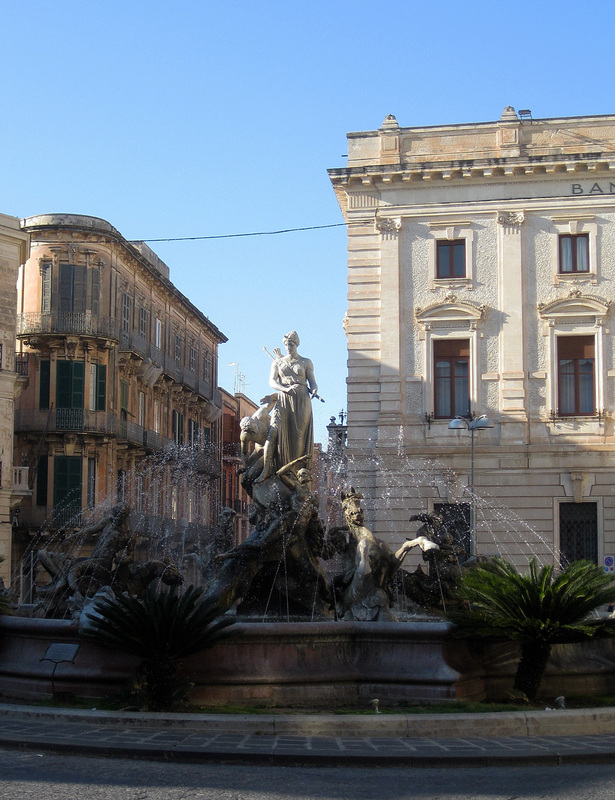 I pictured myself heading back to Catania, having missed the Siracusa bus station. annex, and I was happy to be there as annex rooms have better views of the sea than those in the main hotel. 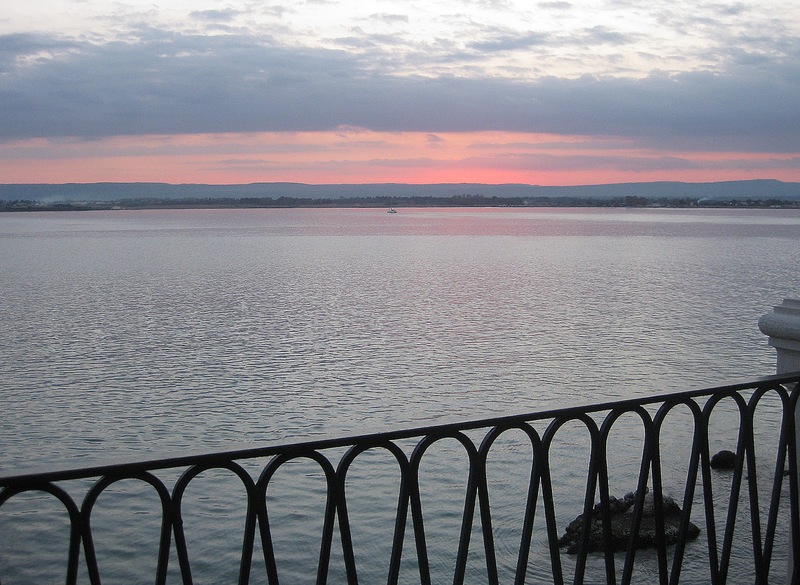 As my excellent hostess, a very cool woman probably in her mid-40s, opened the door to the room, the first thing I saw was the sea, viewed from a tiny terrace next to my bed. If I looked to my left I saw some of the old fortifications of the island, the sea and beyond that the mainland. If I looked right I saw the sea of course, and the curve of the coastline lined with other charming old buildings. It seemed that Dottore Gianni had chosen a near perfect hotel! 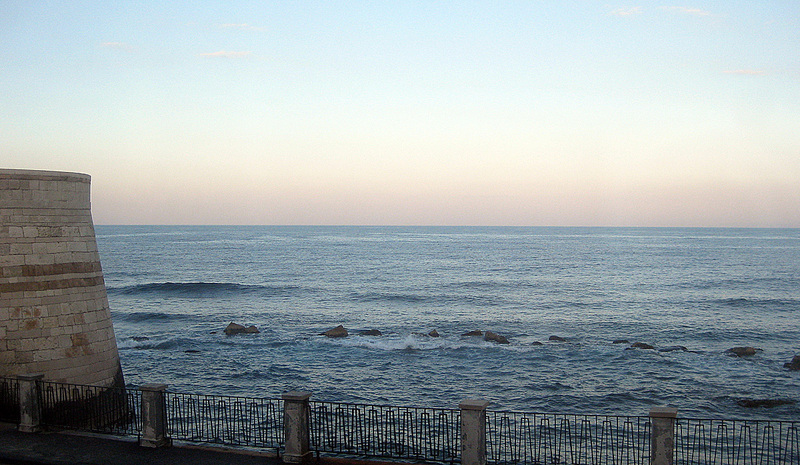 Because of the long wait for the bus I had arrived at the hotel near sunset, and I wanted to get across Ortigia to see it, so I spent little time in the room, I asked my hostess the quickest way to Fonte Aretusa, the perfect place to watch the setting of the sun, and she obliged me by showing as direct a route as possible on a handy map she provided. Ortigia at first seems a labyrinth of tiny streets, some even too small for cars! Never, however, for vespas! But the layout begins to make sense fairly quickly, at least it did for me, though I won't deny some confusion on walks therein nearly every time I left the hotel. It's a great place to get lost in, because it's so small that you're never lost for that long -- a great place for a wander. And as I wandered west I came upon several of the major attractions pointed out in travel books. I first came across the Piazza Archimede, named for the great Hellenic thinker Archimedes who designed the defenses against the Roman onslaught in the early third century B.C. When the city was ransacked by the Romans Archimedes was hacked to death by the conquerors. I'm guessing they didn't really appreciate all the work he put into the city's defenses! The piazza is dominated by a statue of Aretusa, a nymph who...but I think I'll keep my dear readers in suspense for just a bit, at least for another paragraph or two. As Gwendolyn says in the last act of The Importance of Being Earnest: "The suspense is terrible...I hope it continues!" call the most elegant square in Sicily, and it's easy to see why. The piazza is dominated by the Duomo, which you can only just make out in the distance on the right - more suspense for you if you don't mind - but also by other elegant palazzi and a smaller church, Santa Lucia alla Badia, whose claim to fame is a Caravaggio, depicting the saint's burial, that hangs over the altar. And as you can see from the photo, it is a grand open space as well, elegant and inviting. From the Duomo it was only a short walk to Fonte Aretusa, a freshwater spring. The spring was created, if you believe in Greek mythology - and Dottore Gianni does - as Aretusa, a sea nymph, was about to be violated by a lecherous river god named Alpheus who pursued her as she swam all the way from the Peloponnese. As Aretusa reached Ortigia the river god was about to have his way with her when Artemis transformed her into a spring just in the nick of time. 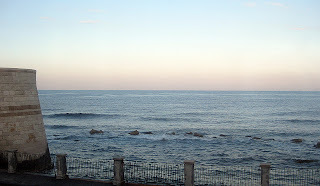 I arrived at the fonte just after the sun had sunk below the horizon, a time when the sky and sea can be even more beautiful than when you can still see the setting sun. A long promenade leads north back to the Porta Marina and the mainland, and also south all the way to the Castello Maniace, at the very tip of the island. 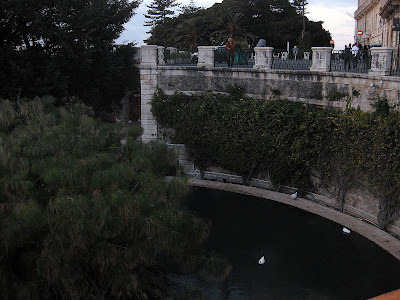 Many people had gathered at the spring itself, others sipped aperitivos at one of the several cafes along the waterfront next to the spring, still others making strolling past it as part of their evening passagiata. I wslked around the spring, then briefly explored the grove of trees next to it, alive with birdsong, perhaps sacred to the goddess. 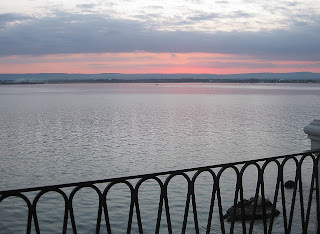 Then I lingered for a while, watching the ever-changing colors, and promised myself to get back to Fonte Aretusa the next day as the sun begins to set. 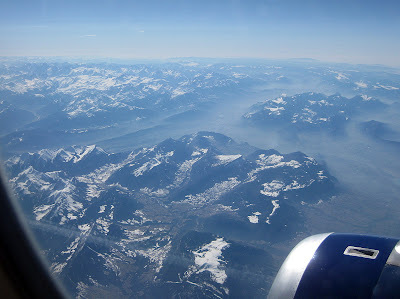 I then turned back east towards my hotel. I took the long way back, getting as close to the tip of the island as I could until I was stopped by the castello. I then walked along the coastline at twilight, a lovely route. Gutkowski, but chose not to go in. Even though it was earlier than any Sicilian would ever think of having supper, I turned again towards the Piazza Duomo, where I'd seen a restaurant that looked rather nice, called the Gran Caffe al Duomo, and presented myself as the first customer of the evening. I chose the fixed price menu, and had, as a starter, tagliatelle con salmone, which was okay but not brilliant, and then spada - swordfish - in the Palermo style, which I assume means the excellent breading atop the fish. That was delicious! I finished with an insalata mista that was just right. Included in the price (25 Euros) came a quarter liter of white wine (which was as usual fine!) and a small bottle of aqua.